Under California Penal Code 25850(a), it is a crime for you to carry a loaded firearm on your person or in a vehicle in any public place or on a public street. If you are accused of violating PC 25850, it is crucial that you call an experienced team of lawyers as soon as possible. A public place, for purposes of PC 25850, is anywhere that is readily accessible to the public. This includes parks, sidewalks, public streets, or any area in which it is unlawful to possess a loaded firearm. b. an unincorporated area where it was unlawful to discharge a firearm. A firearm is broadly defined under PC 25850. Anything that can be used as a weapon capable of discharging a projectile through a barrel by combustion is a firearm under this law. Generally, carrying a loaded firearm in a public place is a misdemeanor in California. However, depending on certain factors, you can also be charged with a felony. If convicted of a misdemeanor PC 25850 violation, you face up to 364 days in county jail, a $1,000 fine, or both. You were carrying while actively participating in a gang. With over 30 years of experience, we are very well-versed on all of the valid defenses to a PC 25850 charge. The police did not have probable cause to arrest you. 1. Can I be arrested for PC 25850(a) for carrying a BB gun? Most BB guns are powered by CO2 and are not fired by combustion. Therefore, BB guns are not considered firearms for purposes of PC 25850. 2. Why was I arrested for PC 25850(a) if the gun was broken? It does not matter whether the firearm is in working order so long as it is capable of firing and was designed for that purpose. 3. What if I did not know the gun was loaded? You need to have knowledge that the gun is loaded in order to be convicted of PC 25850(a). If the prosecution cannot prove that you knew it was loaded, then you should not be convicted. Wallin & Klarich is ready to fight on your behalf. If you or a loved one has been charged with carrying a loaded firearm in a public place in California, you need to contact an experienced Wallin & Klarich criminal defense attorney immediately. At Wallin & Klarich, our skilled attorneys have been successfully defending clients facing gun charges for over 30 years. 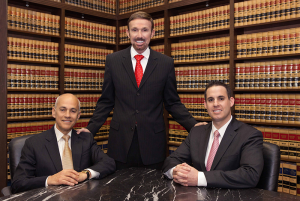 We will meet with you to review the facts of your case, and plan a defense strategy that will help you get the best outcome possible in your case.